While growth is spreading across the entire region, the Caribbean’s unquestioned powerhouse is the Dominican Republic, whose fast-growing visitor arrivals are poised to extend the country’s tourism dominance into the next decade. Travel to Caribbean destinations grew by 4.2 percent in 2016, outpacing the 3.9 percent global rate reported by the World Tourism Organization (UNWTO). Already the most-visited country among destinations tracked by the Caribbean Tourism Organization, Dominican Republic visitor arrivals surged ahead by 6.7 percent in 2016. Government officials and tourism stakeholders at last week’s Dominican Annual Travel Exchange (DATE) conference celebrated the tourism sector’s dynamic expansion, noting the Dominican Republic now has the most hotel rooms in the Caribbean and attracts twice as many land-based and cruise ship arrivals as Cuba, the next closest CTO country. The Dominican Republic’s 5.96 million land-based visitors in 2016 set a national record for arrivals said Radhames Martinez Aponte, the Dominican Republic’s vice minister of tourism: “Not only did we see growth in the [visitor] numbers but there was an increase in the hotel occupancy rate [from] 75 percent in 2015 to 78 percent in 2016. That growth came even as the country added an unprecedented number of new hotel and resort rooms in 2016. The country’s popularity with North American travelers is evident across the distribution network. Leading Caribbean tour operator Delta Vacations “had a banner year in Punta Cana and the Dominican Republic” during 2016, said Karen Kammer, director of Caribbean product development. “The Dominican Republic has now taken over the number in rankings for the Caribbean region for Delta Vacations, she said. Delta Airlines increased service between New York’s JFK International Airport and Punta Cana by six percent last year, she added. Kramer says the Dominican Republic’s visitor growth has been earned: “I think with the growth of so many recognizable brands and new products in the country, they are bringing great focus to the consumers as well as the travel agents. Most of the country’s visitor growth is focused in Punta Cana, the Dominican Republic’s main resort district, which features a cutting-edge selection of upscale, all-inclusive resorts. Yet the Dominican Republic’s tourism growth also continued extending last year to Santo Domingo, the historic Dominican capital city, and Puerto Plata, a seaside town that has experienced resurging visitor interest. During the DATE gathering, two major all-inclusive resorts located on Punta Cana beaches—Secrets Cap Cana and Bahia Principe’s Fantasia—debuted, highlighting the region’s robust resort development. 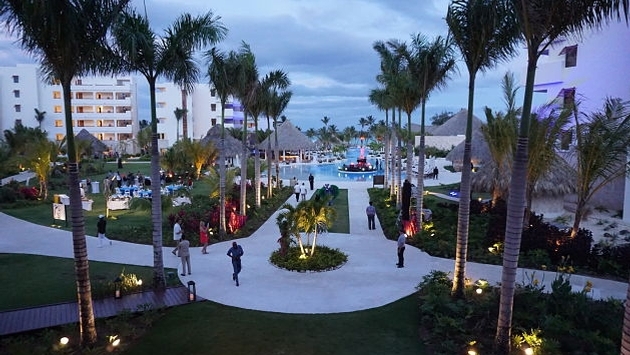 The combination of Punta Cana’s inventive and upscale all-inclusive resorts—nearly all located along the region’s magnificent beaches with close proximity to Punta Cana International Airport—has generated genuine enthusiasm among vacationers. The properties represent the lion’s share of the Dominican Republic’s 75,000 hotel rooms, which Martinez Aponte said is the most among Caribbean destinations. The Punta Cana resorts feature recognized North American brands and entire properties targeted to specific demographic groups including adults, families and romance- and adventure-oriented travelers. Within the past year, adults-only properties including CHIC Punta Cana and the Hotel Riu Republica, opened in Punta Cana, along with the family themed Nickelodeon Hotel & Resort Punta Cana. In 2013, Dominican President Danilo Medina said the government is aiming to achieve 10 annual million visitors within this decade. Thus the country would need to add “another 65,000 hotel rooms,” including accommodations beyond the Punta Cana core, said Joel Santos Echevarria, president of ASONAHORES, the Dominican Republic’s primary hotel and tourism association. Martinez Aponte said nearly 7,000 additional rooms are presently under construction now, and another 8,000 are in contract. “We have to develop other tourism destinations because you can’t just crowd everyone onto the southern coast,” said Santos Echevarria. The Dominican capital city of Santo Domingo combines a well-preserved colonial city with a modern city center. Still Martinez Aponte cited “the arrival of new hotel chains” as the catalyst driving Santo Domingo’s growing visitor activity. While larger properties are hosting increased group activity, new hotels including the JW Marriott Santo Domingo—which opened in 2015—and several boutique properties in the city’s historic district are serving luxury leisure travelers. "At present, there are 27 hotels available that have [benefited from] increases in [Santo Domingo’s] gastronomic, cultural and historic offerings,” said Roberto Henríquez, president of the Hotel Association of Santo Domingo (AHSD). Occupancy rates at Santo Domingo’s leading hotels are higher due to growing meetings and business incentives, said Henríquez. While he declined to name the operators, Henríquez said five new hotels will open in Santo Domingo’s city center within the next two years. Santo Domingo’s Zona Colonial is a UNESCO World Heritage Site, due in part to its status as the first permanent American settlement for 15th-century European explorers. The district features historic, 16th-century ornate mansions, magnificent churches and imposing government buildings. These, along with other structures and public infrastructure, have been refurbished through government-run development projects. “We were able to increase the visitors to the Colonial area by close to half a million” following the improvements, said Martinez Aponte, who added that 1,200 residences, as well as churches in the district, have also received façade renovations. Meanwhile, the government has “launched a recovery” in Puerto Plata that is linked to the 2015 opening of the Amber Cove cruise ship port—a purpose-built facility built through a government partnership with Carnival Corporation. Amber Cove, named for the region’s historically rich mineral resources, “has fueled the increase in cruise passengers that are coming,” said Martinez Aponte. The port has hosted 830,000 cruise passengers since its launch and Martinez Aponte says the port will likely draw 1.2 million cruise passengers in 2017. The cruise port’s redevelopment has ignited interest in land-based travel in the region. In fact, the town is experiencing a rebirth as a tourist draw, as Puerto Plata was at one time among the Dominican Republic’s primary tourist regions. “In the last two years [Puerto Plata] has had an increase of 600 new hotel rooms; that puts them at 12,200 hotel rooms,” said Martinez Aponte. “So we can say we have [started] a recovery in Puerto Plata.